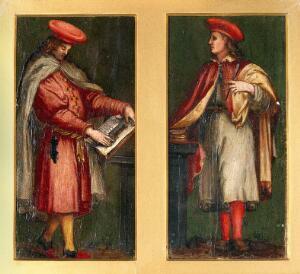 Saint Cosmas and Saint Damian. 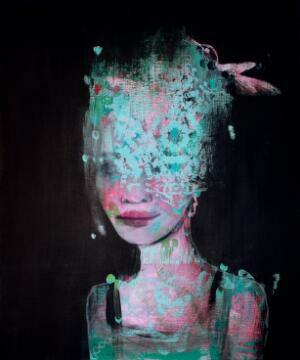 Oil paintings. 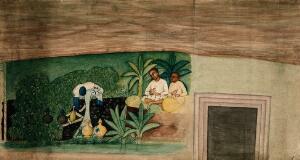 Cave paintings; two Indo-African men resting. Gouache painting by an Indian painter. 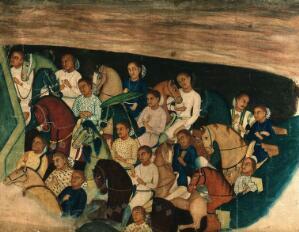 Cave paintings; a group of Indo Africans on horseback. Gouache painting by an Indian painter. 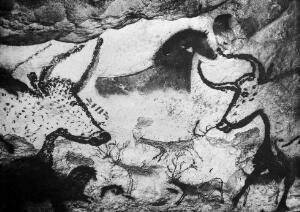 Cave paintings; a group of Indo African men and women riding on elephants and horses. Gouache painting by an Indian painter. Cave paintings; a group of female musicians and dancers and Buddhist monks (?) of Indo-African race. Gouache painting by an Indian painter. 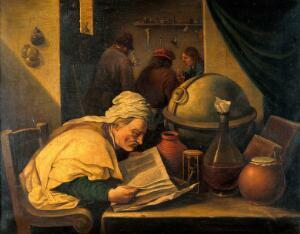 An alchemist in his laboratory. 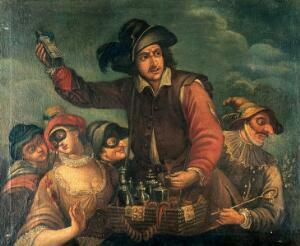 Oil painting after David Teniers the younger. 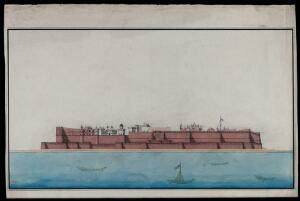 The bay of Naples with the British fleet at anchor, 1 August 1718. Oil painting by Gaspar Burla. 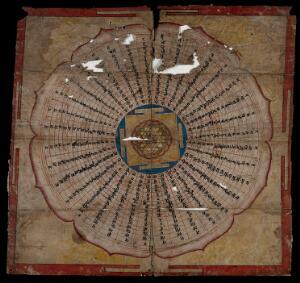 An Indian mandala. Gouache painting by an Indian painter. Agra (? 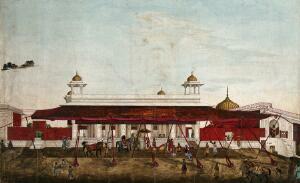 ), Red Fort. Gouache painting by an Indian painter. 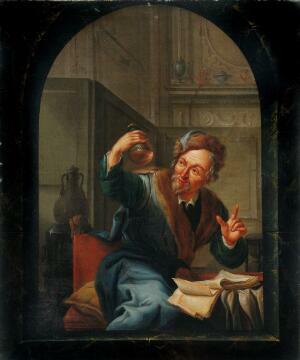 A physician or apothecary examining a flask at a casement. 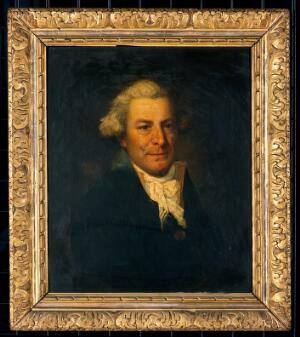 Oil painting by Willem Joseph Laquy, 1780. 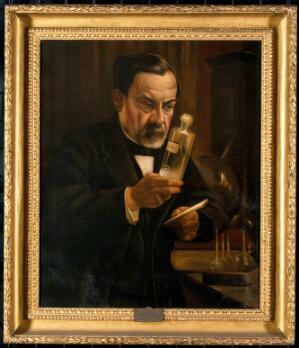 Louis Pasteur, proponent of the 'germ' theory of disease. 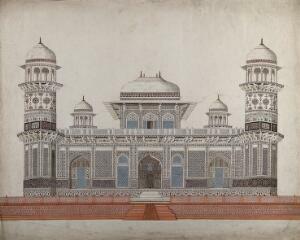 A painted diploma of honour presented to Dr. Robinson Sahib Bahadur, by Sardar Nizam-ul-Mulk, Governor General of Calcutta. Gouache painting by an Indian painter. 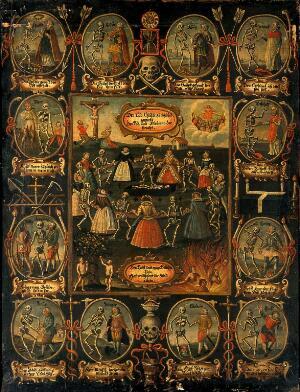 The dance of death. Oil painting. Agra: Gateway leading to the Taj Mahal. 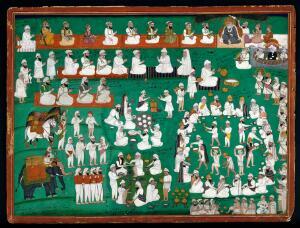 Gouache painting by an Indian painter. A Mughal fort, view from the river. 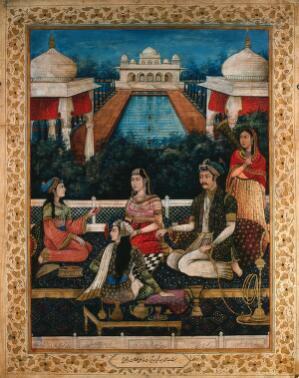 Gouache painting by an Indian painter. A Sikh commander (?). Gouache painting by an Indian painter. 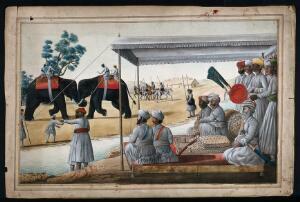 A Nawab and his guest watching an elephant fight. Gouache painting by an Indian painter. 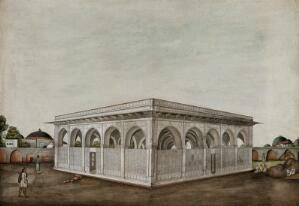 Men sitting and standing outside a Mughal mausoleum. Gouache painting by an Indian painter. Agra: Taj Mahal, view from the back. Gouache painting by an Indian painter. 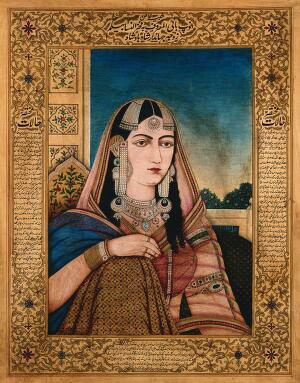 Mohammad Shah Bahadur's begum. Gouache painting by an Indian painter. Two Englishmen on elephants riding in convoy before a Mughal palace or tomb. Gouache painting by an Indian painter. 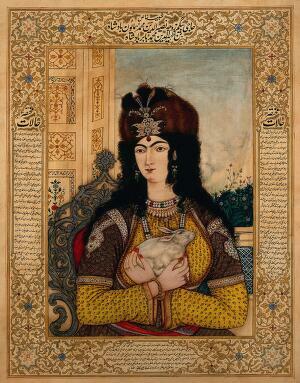 Badshah Humayun's Begum holding a rabbit. Gouache painting by an Indian painter. 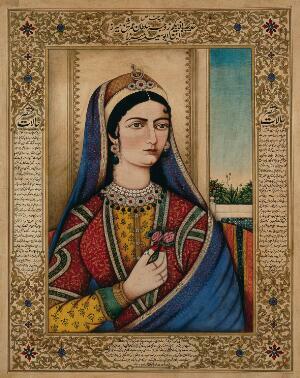 A female member of the Mughal royal family. 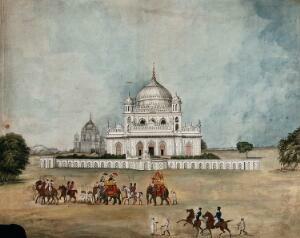 Gouache painting by an Indian painter. 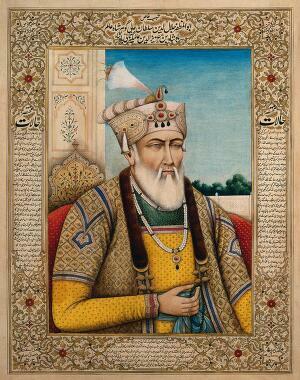 A Mughal emperor or member of a royal family. Gouache painting by an Indian painter. 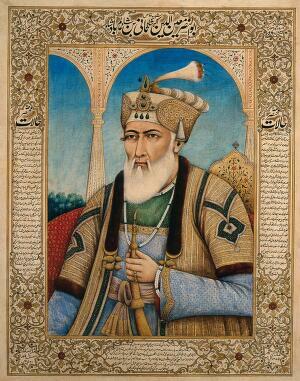 An elderly high ranking member of a Mughal court. Gouache painting by an Indian painter. 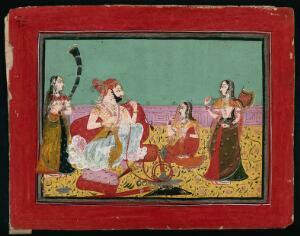 Badshah of Jalundur's begum holding a sword and a shield. 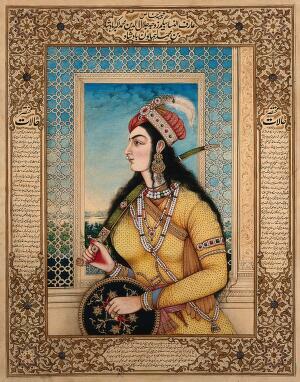 Gouache painting by an Indian painter. 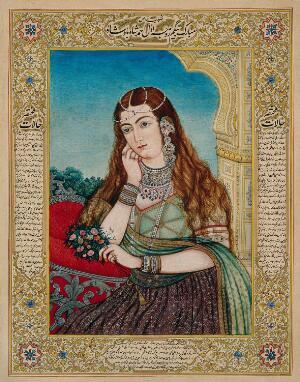 A Mughal courtesan (?). Gouache painting by an Indian painter. 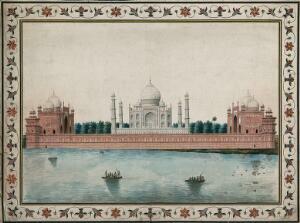 Agra: marble mausoleum of I'timad al Daula, decorated with mosaic and marble inlay work. Gouache painting by an Indian painter. 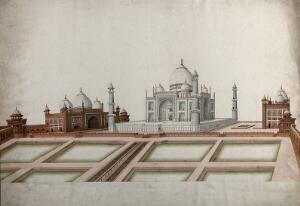 Agra: View of the Taj Mahal and the two red sand stone buildings on either side. Gouache painting by an Indian painter. 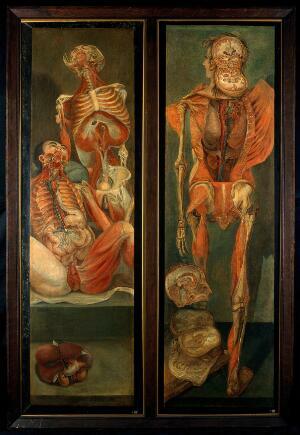 "The physician's verdict". 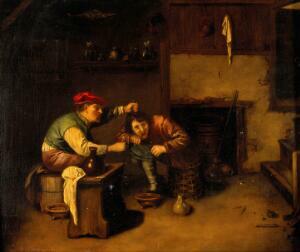 Oil painting by Emile Carolus Leclercq, 1857. 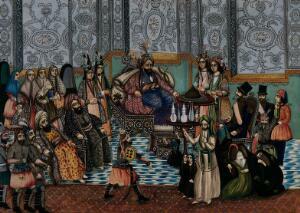 The king of Persia sitting on a horse with his entourage of officers, bodyguards, footmen and executioners around him. 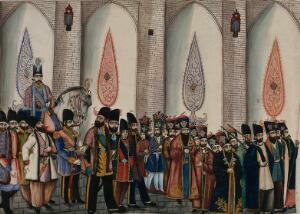 Gouache painting by an Persian artist. Mezed, the 7th Caliph of Arabia, in his court, watching Shamar raising his sword at the Imam. 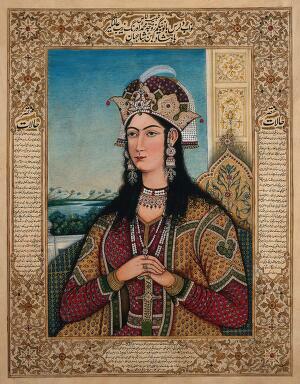 Gouache painting by an Persian painter. 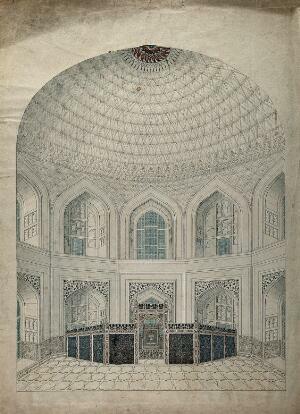 Agra: the Taj Mahal, interior view of the vaulted dome over the tombs of Shah Jahan and Mumtaz. Gouache painting by an Indian painter. 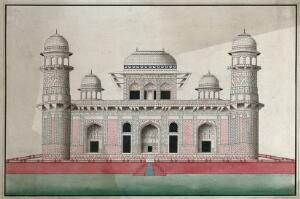 Agra: Mausoleum of Itmad-ud-Daula's, decorated with pietra dura in an amazing variety of geometrical arabesque. Gouache painting by an Indian painter. An elderly member of a royal family, holding prayer beads. Gouache painting by an Indian painter. 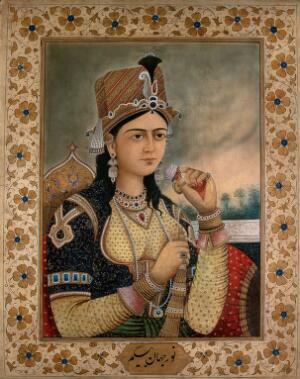 A Mughal empress or member of a royal family holding a necklace. Gouache painting by an Indian painter. 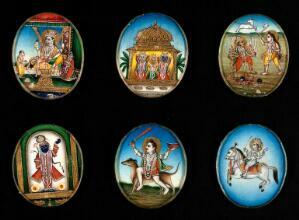 A collection of Indian costumes, types and occupations. 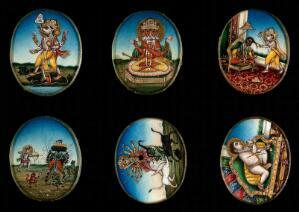 Gouache paintings by an Indian artist. 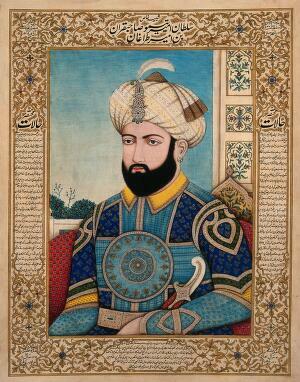 A Nawab (?) holding a hookah pipe, as a woman dances in front of him, watched by some musicians and a group of people. Gouache painting by an Indian painter. 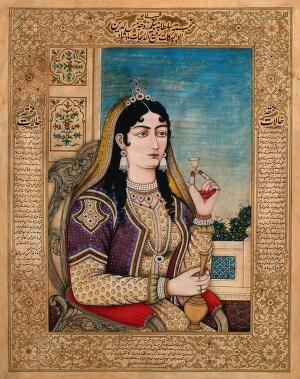 A Mughal empress or member of the royal family holding a small cup and a jug. Gouache painting by an Indian painter. 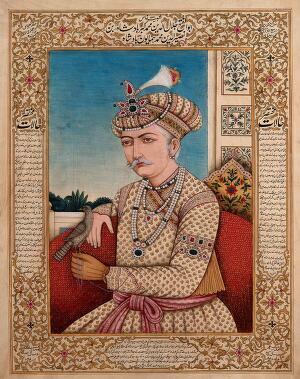 A Mughal emperor or member of a royal family, with a falcon (?) pirched on his hand. Gouache painting by an Indian painter. 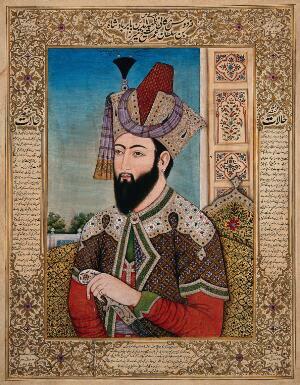 A Mughal emperor or member of a royal family holding a turban ornament: in profile. Gouache painting by an Indian painter. 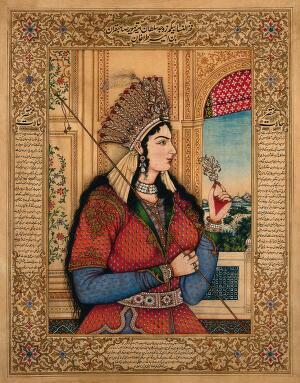 A Mughal empress or member of a royal family holding a spear and turban ornament. Gouache painting by an Indian painter. 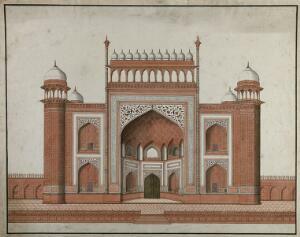 Delhi, Palace of Emperor Shah Jahan, the gate of the council chamber. Gouache painting by an Indian painter. 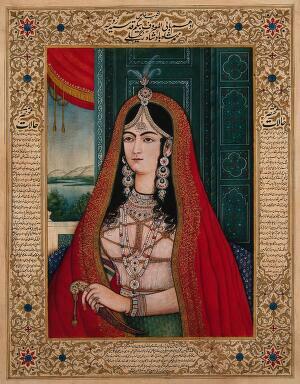 An European woman in Mughal costume and jewellery. Gouache painting by an Indian painter. 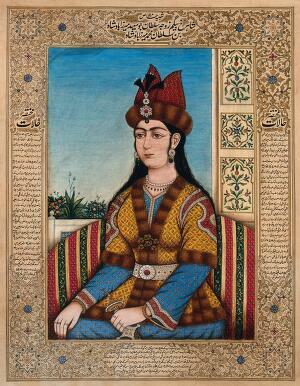 A Mughal Empress or member of the royal family, sitting straight, with one hand over the other. Gouache painting by an Indian painter. 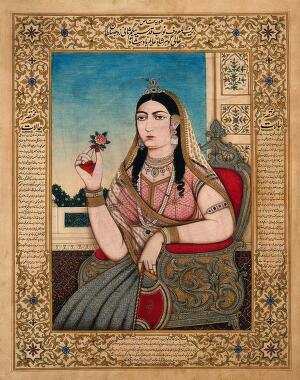 A member of a Mughal royal family sitting on a chair, holding a fan and a flower in her hands. 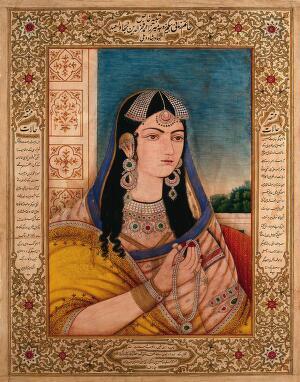 Gouache painting by an Indian painter. Interior with a physician examining a urine flask. 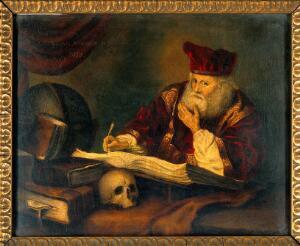 Oil painting attributed to Gerard Thomas or Balthasar van den Bossche. A home birth. Oil painting by Karl Hagedorn. A European (?) 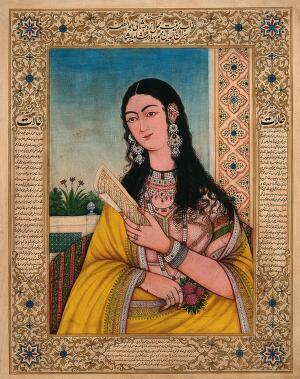 woman wearing Mughal costume and jewellery. Gouache painting by an Indian painter. 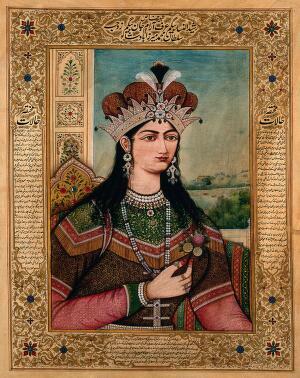 A Mughal empress or member of a royal family: three quarter profile. 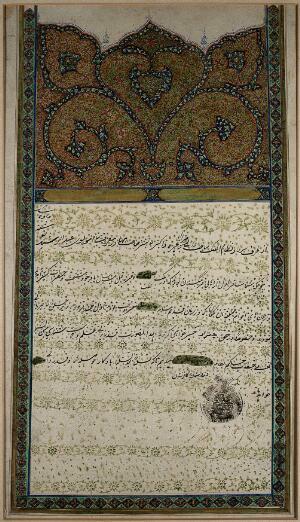 Image decorated with a floral arabesque border. Gouache painting by an Indian painter. 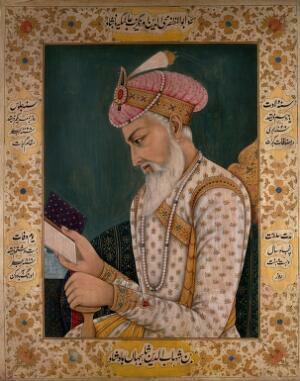 A Mughal emperor or member of a royal family reading a book. Gouache painting by an Indian painter. 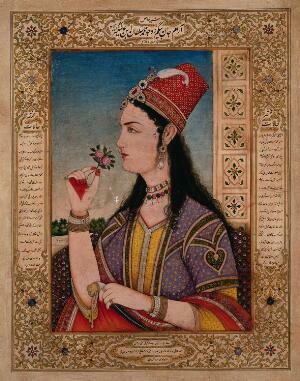 A Mughal empress or member of the royal family holding a flower. Gouache painting by an Indian painter. 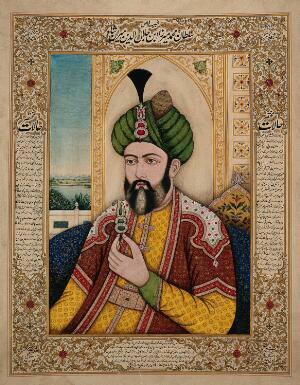 A member of the Mughal royal family holding a turban ornament. Gouache painting by an Indian painter. A western (?) woman in a Indian dress holding a sheet of paper. Gouache painting by an Indian painter. 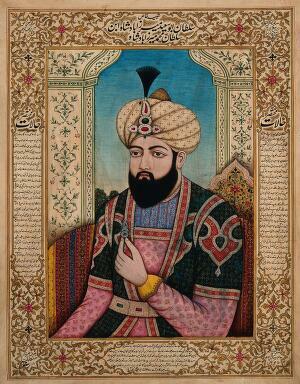 A member of the Mughal royal family. Gouache painting by an Indian painter. Kings and other devotees paying homage to Guru Nanak, as food and drinks are organised and served to a number of people. Gouache painting by an Indian painter. 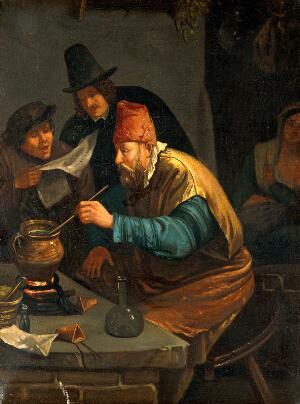 A lady visiting an alchemist in his laboratory. 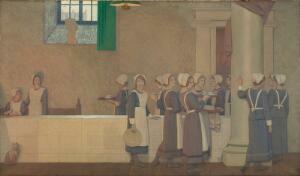 Oil painting attributed to Jan Josef Horemans, 17--. 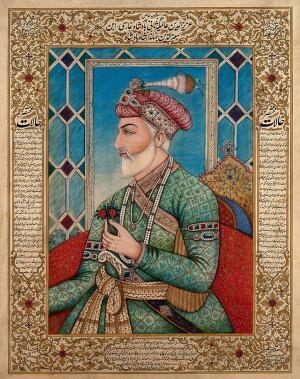 A Mughal emperor or member of a royal family holding a flower: profile. Gouache painting by an Indian painter. 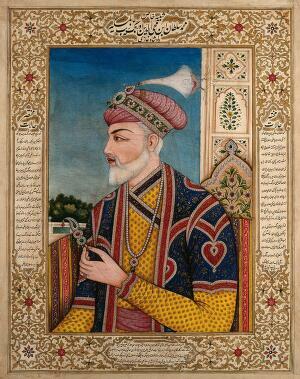 A Mughal Emperor or member of a royal family holding a turban ornament. Gouache painting by an Indian painter. 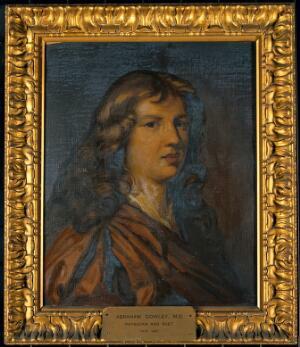 Abraham Cowley (?). 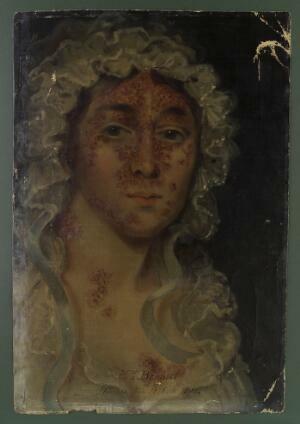 Oil painting after Mary Beale (?). An operator extracting a tooth. 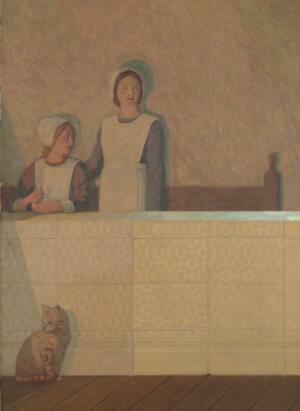 Oil painting after A. Brouwer. 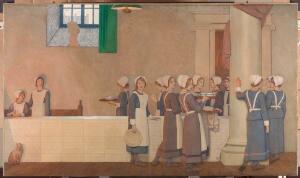 Orphan girls entering the refectory of a hospital. 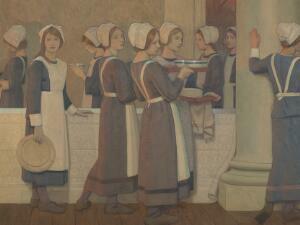 Oil painting by Frederick Cayley Robinson, 1915. Emperor Akbar (?) holding a hookah pipe, sitting with three women and playing a board game while a female attendant stands behind him with a fan. Gouache painting by an Indian painter. 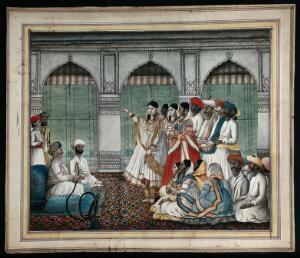 A darbar scene; the Nawab (?) 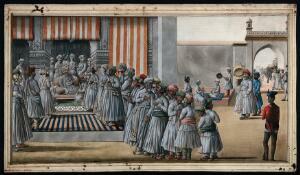 sits on the chair listening to a man, while on the right, another man walks through the gateway towards the darbar. Gouache painting by an Indian painter. An European (?) woman wearing Indian clothes and jewellery sitting on a chair, holding a flower. Gouache painting by an Indian painter. 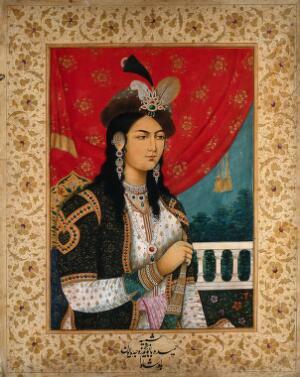 A Mughal emperess or member of the royal family wearing an elaborate crown and holding a flower. Gouache painting by an Indian painter. 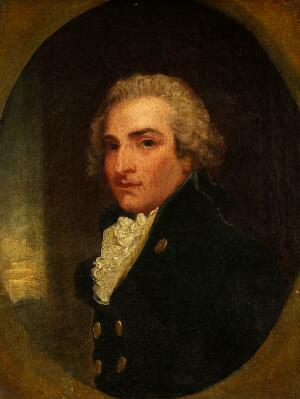 A man (Edmund Cartwright?). Oil painting. An alchemist. Oil painting after Jan Havicksz. 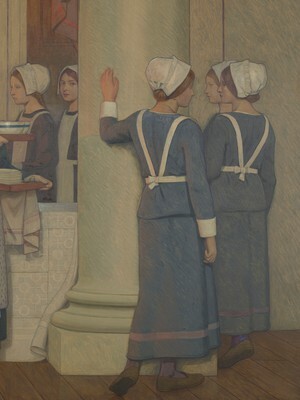 Steen, with a mirror below. 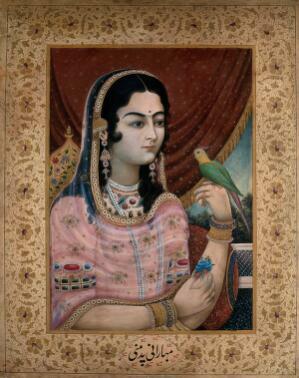 A Mughal courtesan or member of a Mughal royal family looking at a parrot perched on her hand. Gouache painting by an Indian painter. 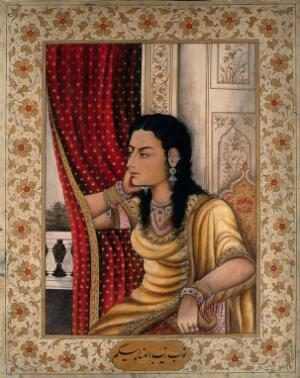 A Mughal courtesan or member of a royal family looking out of a window: three quarter profile. Gouache painting by an Indian painter. 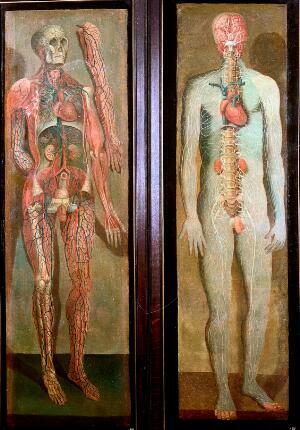 Saint Sebastian. Oil painting by Santa Cruz. Maharaja Deepseev (?) 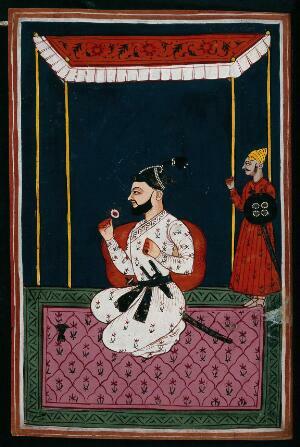 sitting and smoking a hookah pipe, as two female attendants fan him and a third looks on. Gouache painting by an Indian painter. 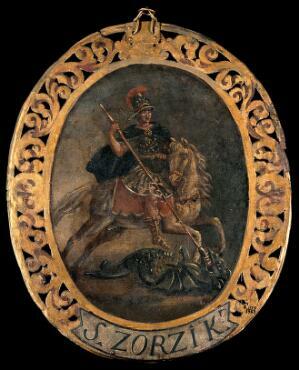 Saint George. Oil painting by a Georgian painter. A man removing a plaster; representing the sense of touch. 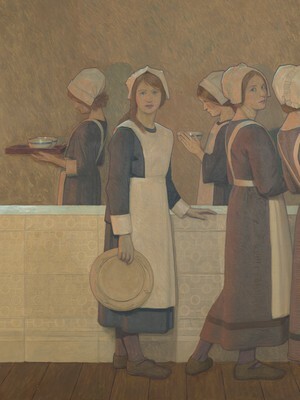 Oil painting by Lucas Franchoys II. 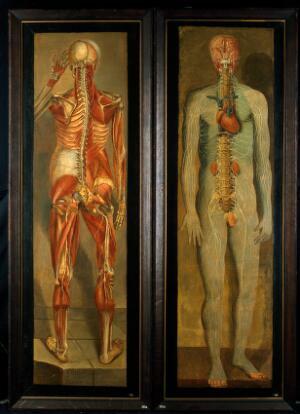 A man supposed to be Nicholas Alcocke, surgeon to King Edward VI. Oil painting. The birth of the Virgin. 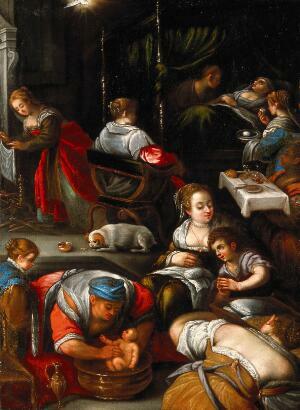 Oil painting after Francesco Bassano. 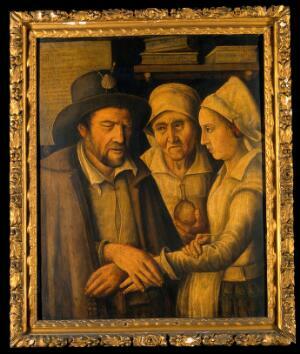 "Maistre Robert", a blind healer healing by laying-on of hands. Oil painting. 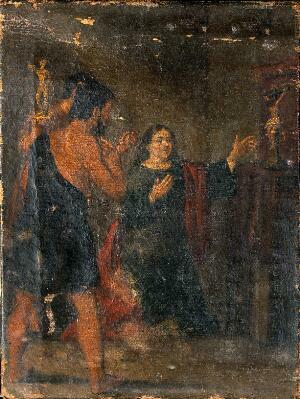 Martyrdom of Saint Emerentiana. 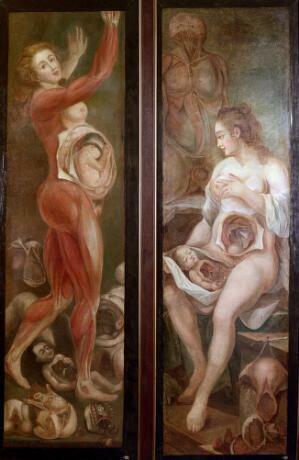 Oil painting by a Spanish painter, 18th (?) century. Robert Jackson (?). Oil painting, ca. 1800 (? ).